Artists in Houston are taking stock of the storm’s devastating impact and the long process of rebuilding that lies ahead. More than a week after Hurricane Harvey slammed Texas’s southeast Gulf Coast, Houston artists are only now beginning to evaluate the extent of damage to their studios and take stock of lost artworks. 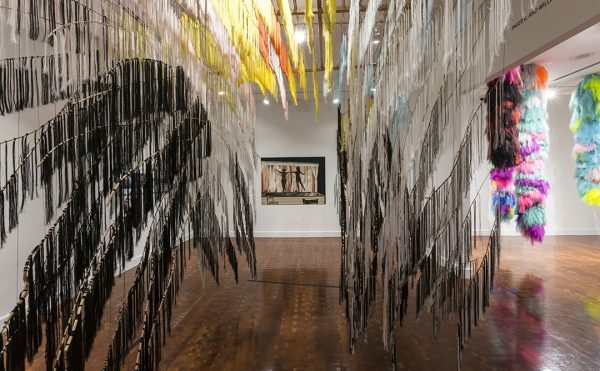 That’s a difficult task in any post-catastrophe situation, but it’s made more complex by Houston’s sprawling size and the ways in which artists set up their practices in a metropolitan area that’s more than 10,000 square miles — an area larger than the state of New Jersey. One of the nation’s fastest growing cities, Houston has a population of over 6.4 million, and with little in the way local zoning regulation, development has sprawled virtually unchecked. The city’s major art museums — almost all of which are located in a central area of Houston — emerged from the storm for the most part unscathed. The city’s artists, however, did not fare so well. 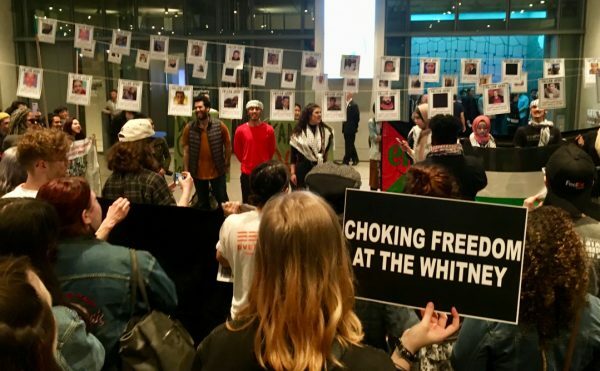 Rachel Cook, curator at the Houston arts nonprofit DiverseWorks, said she that as the rain began to let up, she began checking on the members of the organization’s artist advisory board. 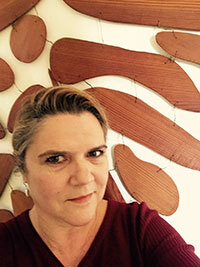 Keliy Anderson-Staley, a photographer and University of Houston faculty member, said she chose her house in Meyerland, a midcentury subdivision in southwest Houston, precisely because it had a small apartment over a detached garage that made a perfect studio for her practice, which involves wet plate collodion tintype photography. But the Meyerland neighborhood suffered widespread flooding as the storm raged, forcing Anderson-Staley, her husband, and their two small children to evacuate after two days of constant rain. Anderson-Staley has flood insurance on her home, but like other Houston artists affected by Harvey, she has turned to crowdfunding to help rebuild her studio. As of press time, her GoFundMe campaign has surpassed its $25,000 goal by more than $5,000. “I’m really overwhelmed by the support,” she said. Photographer Emily Peacock and her husband, the sculptor Patrick Renner, live and work in a converted autobody shop in a neighborhood just north of Houston’s Interstate 610 loop — a relatively central location. Peacock had been in the process of preparing prints for a solo exhibition that opens this week at Austin’s Big Medium gallery. Roof damage caused by the more than 50 inches of rainfall that hit Houston left Peacock’s studio drenched. She turned to crowdfunding, too. Sarah Paige Welch and James Beard use the first floor of their unit in a 1903 building in downtown Houston for their individual studios as well as Mystic Multiples, their print shop that produces zines and comics. 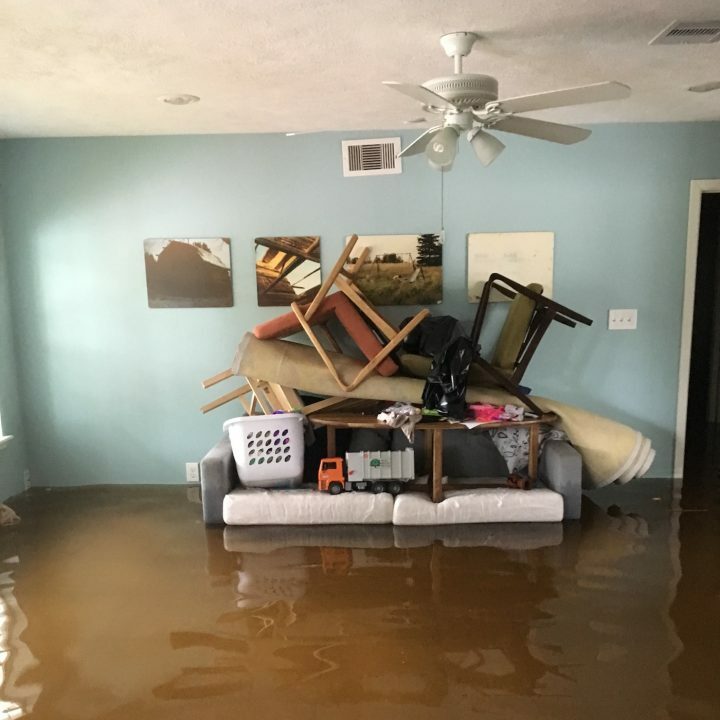 The couple awoke in the middle of the night on August 26 to find that about 15 inches of water had pushed their way in, while the street outside was under more than four feet of water. “We were able to quickly move small things upstairs into the loft, but obviously couldn’t save everything,” said Welch. Welch and Beard lost paper stock, tools, artworks, and a 1920s letterpress. The couple’s kitchen is also on the first floor and they lost their stove and refrigerator, along with personal possessions. 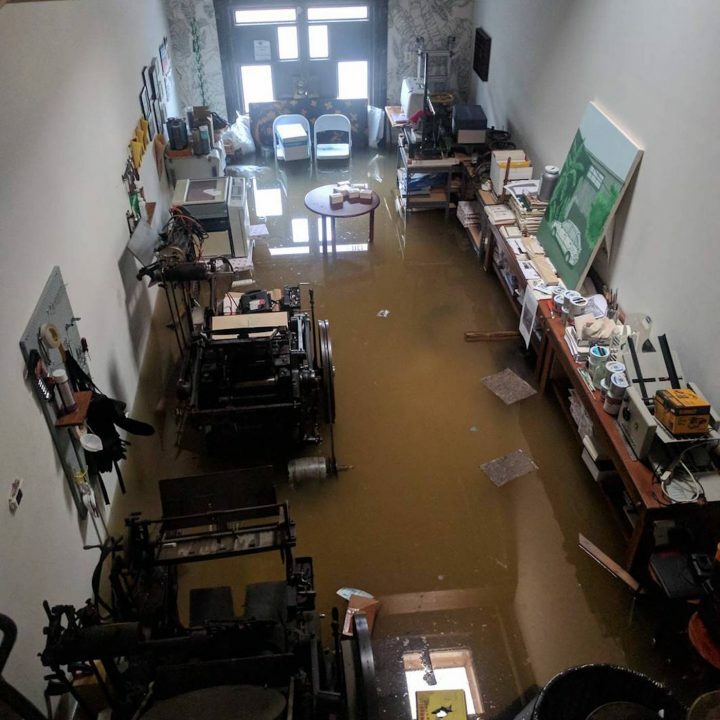 “We don’t yet know how long we will be out of home and print shop,” said Welch, who said their renter’s insurance doesn’t cover damage due to floods. Welch and Beard have also set up a GoFundMe page in the hopes of covering some of the costs of the disaster. 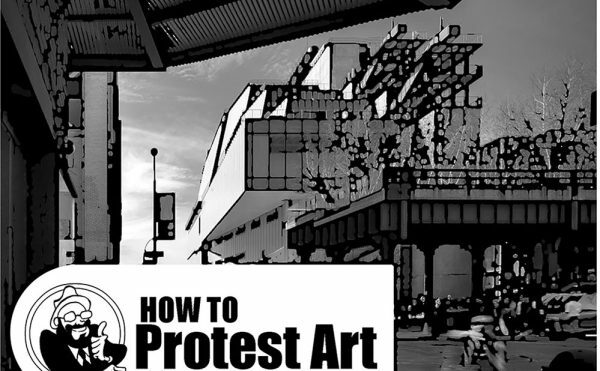 To help artists like Welch and Baird, Dennis Nance from the Galveston Art Center is collaborating with Houston arts organization Fresh Arts to keep an updated a list of artist-focused disaster relief resources.